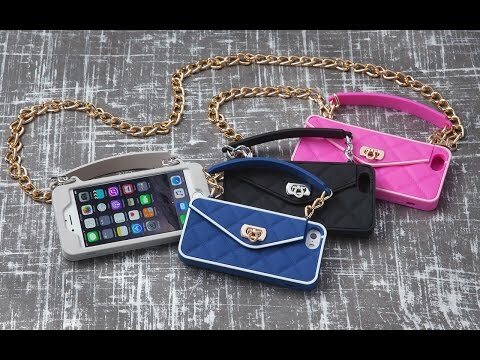 Pursecase turns your phone into a tiny designer purse. 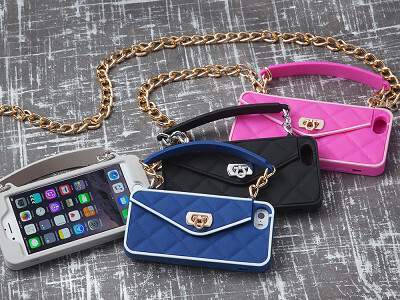 This silicone phone case cleverly mimics a quilted handbag. Carry your phone in style, and hands-free, over your shoulder or wrist. As functional as it is adorable, Pursecase won’t interfere with your phone’s screen or camera. You’re free to dial, scroll, and even take pictures. A small pocket lets you carry other essentials, like an ID, credit cards, and cash. And the compact mirror comes in handy to check yourself on the go. 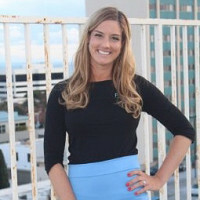 Founder Kelley Coughlan Weaver is a busy publicist who wanted a fashionable way to carry her phone. So she invented one, then brought it to "Shark Tank” and got funding for her phone purse. If someone stops and asks where you got your Pursecase, don’t be surprised. We’ve had many impressed passersby question us about this new must-have accessory. Hello everyone! I'm proud to introduce Pursecase to The Grommet. I'd be happy to answer any questions you have! Why is this something every woman with a phone should have? Pursecase is a simple way to keep all your essentials at your fingertips. It’s fashionable, elegant, stylish, and a lot of fun. It’s a conversation starter. When you go to the grocery store and whip out your credit cards, someone will almost always comment on how great of an idea it is and that’s part of the fun when carrying a Pursecase. It attracts a lot of attention and is so handy, I have women come to me all the time and say to me, I don’t know how I lived without this before but it’s fantastic and I love it, which is so rewarding to hear. @Kelley I have a Droid Maxx. Would buy one in a minute if you make it. Also, before I started reading all the comments, I thought your pricepoint is right on. I actually thought it was a little on the low side. Keep up the good work. Thanks, Kay! Keep a look out for product updates! This purse really seems like it covers everything. Was this the version from the get-go or did you add features as you went along? Well thank you! The design of the Pursecase has only been modified slightly since we launched for improvements in quality. We added the wildly popular cross-body chain as an add-on originally, but due to such overwhelming demand we now sell the Pursecase bundled with the cross body chain strap. Ladies love being able to be completely hands-free! What inspired you to create this then turn it into a business? Was it an ‘aha’ moment or more of a gradual process? I own and run a PR company called Melrose PR, so I am always busy and on-the-go. I was always putting my phone down and dropping it, so I wanted to create something that was easy to use, that could keep all my essentials like; business cards, drivers license, credit card, ID, and cash all at my fingertips, but also have my phone in a safe, secure case that could hang on my wrist. So I had this idea and bounced it around different influencers and bloggers that we worked with a lot and everyone kept reassuring me how good of an idea it was. I kept looking for a product similar to it, but couldn’t find one so that’s where the idea came from. When I was able secure our domain name and find that Pursecase was available on Facebook, Twitter and Instagram, that was my indication that I should go for it and so we took what was an idea and made it into a reality. It was quick, we made a prototype and launched it on Kick Starter, then took it into Shark Tank. Since then it’s been wildly popular. Just because I’ve never asked anyone this question, what was it like to be on Shark Tank? What don’t we see on TV? It’s actually just as intense as it appears on TV, except maybe even more so! On TV you only see roughly 7 minutes of what can be up to 2 hours “in the tank.” Our session was just under one hour, and although it was scary, it was so rewarding. We were so prepared for every possible question, so we came across professionally, and it worked out very well! What do you expect the feedback from The Grommet community to be like? We expect the feedback from the Grommet community to be fantastic. We are so excited to launch. I love the Grommet and have loved it for years. We’re really excited to bring this to so many people who are looking for unique, creative and innovative products everyday. We couldn’t be more excited to be apart of the Grommet community, so we’re looking forward to seeing what this will bring. Do you offer your product for other phone models? I have a Galaxy S5, and would LOVE to purchase a Pursecase. Hi Joy, Pursecases for other phone models will be out shortly and as soon as they are, you can be sure we will be adding them on site! Stay tuned! @Mike I have a Galaxy 6S Edge+ - I would love to have one of these purscases. Is there a list I can get on to be advised when they are ready? Updates will be included in the daily email, Carolyn! I was wondering the same thing! I have a Galaxy 6 and have been looking for something like this for a long time! Looking forward to the updates! Hi @Carolyn and @Andi, great question. Right now we make pursecase for the iPhone models only, but we may launch Samsung Galaxy models in the future! I apologize that we don't have something to offer you at this time. We hope to have you stylin' and dialin' in the future! Also please leave a comment with which specific Android models you would like to see- i.e. Samsung Galaxy S5, or Samsung NOTE 4, or LG G2, etc. Since we have to make molds for each phone, it helps for us to know the demand before we mass produce for each phone model. Thanks! @Kelley I would like to see one for a Samsung Galaxy Note 4, please. Keep an eye out, Linda! @Mike I would like one for my Samsung Galaxy Note 3. Galaxy S6 I was ready to buy one this second, darn it! Samsung Galaxy S3, please, please, please! Thanks! I have a clutch that I paid $4 for. Why so expensive ? Are they leather. I would buy another, but cost is prohibitive. Hi Judith, Pursecase is almost exactly inline with other phone cases on the market and it looks better than just about all of them. They are made of silicone so you know you are paying for a durable product as well. I can't imagine a $4 clutch falling in the durable category. @Judith our major differntiator is our concealed pocket along with the chain handle. We actually own the utility patent on this. It's a high-quality, protective silicone case that is well-made and also has the purse pocket feature, as well as a compact mirror. Given those features, we feel the price point is competitive. We hope you'll consider purchasing one from the Grommet to see for yourself. Thanks for your question! Looking forward to the galaxy 5s case. Stay on the lookout, Joan! @Mike Nice idea but I don't think I will pay $25-35 for it. We don't want anyone breaking the bank, Phylis, but Pursecase is exactly inline with just about every phone case out there, the silicone material makes it incredibly durable, AND it doesn't look like you picked it out of a scrapheap in The Matrix. It's sort of a win all around. @Joan- the iPhone 6 pursecase fits SOMEWHAT on the Samsung Galaxy S5 phone model. It's by no means a perfect fit, and the camera does not line up (as it wasn't made for that phone) but we have some die-hard pursecase fans who use them on their Samsung Galaxy S5 as they couldn't live without the product! *I repeat, it's not a perfect fit, but it does fit the model and protect it. Some features of your phone might be difficult to use with this particular case on. @Kelley - Any chance that the current case would fit a Droid Mini? @Patricia - Also, any chance you could make a "generic" smartphone case? Maybe that would cover most of the other phones out there...?! Hi Patricia, there really is no generic phone size which makes that tough. Your best bet is to measure the size of your phone and see how it compares to the sizes available. I must of missed something because I do not see what types of phones can fit in this purse. It's for iPhone now, Jeannie, but more models will be out soon. Stay tuned! @Mike Which model of iPhone? I have the iPhone 6 plus which is a lot larger than the 5 and has a camera on front and the back. Will it fit that? or the earlier models? Hi! Do you think there would be enough room for a small tube of lipstick or gloss? or is there an attachment that would work for that? LOVE THIS!!! Hi Lyndia, thanks for the kind words! There is a pocket on the back that could probably fit a small tube of lipstick. @Mike As a woman "on the go," a place for car keys would make it much better. Not everyone lives in a place where public transportation or taxis/Uber are how we roll. Actually, I would guess most women need space for keys, lipstick, and probably a brush or comb. Now, if with your spouse or on a date, this would be perfect! I will probably clip my keychain onto one of the clips that attaches to the case when I need to. It won't look as pretty but it will function like I need it to. Hi Alice, that is a great idea. Fashion and function! Lynda, you could use the key solution Alice mentioned and you should have no trouble fitting a comb or small tube of lipstick in the pocket on the back. @Lynda and @Alice yes we have a lot of customers who attach a lobster claw keychain so they can add keys. The cross-body chain strap is detatchable so you can use the lobster claw on that to clip keys. We hope you love the product, and can't wait to hear how you use it!! Does the cross body chain come off (is it removable)? Almost, Cheryl. They will be available soon and when they are, we will get them on site! Stay tuned! @Cheryl as Mike said- please keep checking back on The Grommet for new models! What type of Samsung Galaxy do you have- i.e. the S5 or S6 or S5 mini... there are many different styles. Are there plans to make a strap that is not chains? Metal irritates my skin. Thanks! @Michele the small chain handle on the pursecase is actually made of silicone, which hopefully wouldn't irritate you, but there are small metal loops on each side. We do plan to roll out different cross-body strap options in the future, so check back on The Grommet for new products and additions. We may do a "sporty" version of the chain, for those who want to take it on power-walks, etc! I have a Samsung Note 3. Will it fit? Not yet, Rosalind, but further product availability is coming soon. Stay tuned! It sure would be nice if you had phonecases for the NOTE out by Christmas shopping season! If they are, we will certainly let you know, Paula! @Paula thanks for the feedback! What model of the Galaxy NOTE would you like to see? There are a few different versions. We are taking all android requests into consideration. Thank you for your feedback! I have a Note 4 and would love to see one for that model. Thanks! I recently paid $30 for a pleather phone case that isn't at all durable and I have to open it each time I use it. The camera function is especially annoying because the flap consistently gets in the way. Can't WAIT until you develop one for a Samsung! Thanks so much, Lisa! I was really amazed at how Kelley thought of everything for this! @Mike @Lisa I'm so flattered! Lisa what type of android do you currently have? It sure can, Karen! It fits almost every iPhone. You can see all of the options on the dropdown menu when you click "buy" below the video. Does this case work for iPhone 6? @Julie I meant to ask if it fits the iPhone 6vPLUS. @Julie I also wanted to add that the iPhone 6 case also fits the iPhone 6S, and the iPhone 6 Plus case also fits the iPhone 6S Plus! So the brand new models fit in pursecase!! I would love to have this for my LG Vista phone if one would be made for that model. Also, purple and gold would be nice colors to add. Thanks for the feedback, Leslie! I love this idea and I remember seeing it on Sharktank, thinking "what a great idea!". I'm interested in getting a couple of the IPhone ones as gifts, and getting myself the Galaxy one when it comes out. QUESTION: Can you answer the phone and talk on it while it is still in the purse (by putting it up to your ear while it is still in the purse)? AND can you talk on it via bluetooth while it is still in the purse? Thanks! Yes and yes, Tracie! Whoever you are getting this for is going to love it! @Tracie- thank you!! What type of Galaxy do you have? YES you can answer the phone and talk on it while its still in the pursecase, you can actually use ALL the features of your iPhone while it's inside the pursecase, that's part of why its so great!! Protects it 100% of the time and doesn't compromise the awesome iPhone features like charging, bluetooth, the camera, etc. Thanks for the reminder, Kendra! Kelly - love your product! I hate lugging a big bag when I dash out to run errands. Do you have any plans to offer the pursecase in both gold chain as well as silver? I would like to purchase one, but right now I tend to wear more gold than silver. I am ocd when it comes to mixing gold jewelry with silver accents on clothes, boots, etc. I prefer the black other than a colored pursecase. Any possibility of designing it with interchangeable hardware/chain? Probably not cost effective, but love the idea so much I have to ask! Thanks you. I'm sure it is always a possibility as they continue to develop the product, Camilla! Great ideas! Stay tuned for any updates! Hello, is this for an iPhone 5 or 6? @Kimberly I saw both choices when I clicked onto the item with the chain strap. I imagine the shorter handle option also shows you the choice upon clicking it. Camilla is right, Kimberly! They are both there! What versions of IPhones does this fit? Would like to see option to allow the material on the short handle to be used on the cross body chain as well so metal isn't touching my skin. What type of silicone is used? Does it make it water resistant? Hi Debbie, you can see a full list of iPhones it fits on the drop down menu by clicking "buy" below the video. A different cross body material might be coming out in the future. the silicone will make it somewhat water resistant but not completely so definitely exercise caution. Is there an option for a material or leather strap instead of a chain? Not at the moment, Sherri, but it could be a possibility for the future! Could be a possibility for the future, Beverly, stay tuned! @Beverly indeed- check back on The Grommet as we may expand our product offerings! The silver is also really pretty. Love the concept, but not everyone has an iPhone. I was ready to purchase the crossbody clutch, but then discovered it's only for an iPhone and I have a windows phone. A clutch that could be used with all phone types would be great. It's on the horizon, Patricia! Stay tuned! I love the look of this, however I would only use it with the cross body attachment, and a chain isn't the look I'd like . How about the clutch with no handle and cross body leather? Thanks for the feedback, Colleen! I have no doubt Kelley and co. will take it into consideration! I am currently in the process of moving and have no desire to buy anything. Having said that, however there are three people I can see myself buying these for as Christmas gifts. Is there a possibility that you will reintroduce these nearer the Christmas season? More product availability will likely be introduced around the holiday season, but I'm not sure what you mean by "re-introduce." I see this as a n introduction and was simply wondering if you would be bringing this and other models back again nearer Christmas. It's certainly possible, Shay! Keep an eye on our daily emails because we will have updates in there! @Shay--I did want to further clarify that this is not just a one day offering at Grommet like you might find at daily deals sites. We support and offer our launched Grommets for the long haul...you will be able to find the Pursecase all the way through the year--as long as we have inventory. Hi Becky, the iPhone 6 will fit in the Pursecase. I don't think you will be able to fit the case you have now in one though. I have the Otter Box on my phone for protection. Will it fit in this purse? I'd hate to lose the awesome protection of the Otter Box, but I do find it rather ugly so I'd like to put it into that cute little purse! You are in luck, Joan! There is a Pursecase for an iPhone 6 and the silicone material makes it nice and durable! Will the iphone 6+ fit in the Clutch? Is the crossbody chain able to swith out with the clutch handle? Hi Beth Ann, the iPhone 6+ will fit in the clutch! You attach the cross body chain to the clutch handle instead of switching it out. I have an iPhone in an Otter Box case & I want to make sure that I would be able to fit my phone in the case into the Pursecase? That I'm not sure of Marcia. I would measure what your phone's dimensions with the Otter Box is and then compare it to the largest Pursecase. I think that is your best bet! Will an iPhone 6+ in a mophie charging case fit? Hi Beth Ann, it might because of the stretchable nature of the silicon, but you would likely put a lot of stress on the material and compromise the product. @Mike - will wait to see if the product will be available in a slightly larger version. Thanks Mike. Hey Kelley.....How great to see this on The Daily Grommet! I will spread the word about this amazing brand. Congratulations!! Thanks so much for the kind words, George! Tell everyone! Don't worry, Dajia! They are coming. Keep a look out in your emails for updates! I have a 6+128G with a battery backup case on the back, will it fit in your case? My guess would be no because it would be tailor made for the 6+. While the silicone material is flexible, if it does fit, you will be putting a lot of stress on the material. It is made in China, Kathy! Will the iphone 5s size fit and iphone 5c? Hi Kelly... thought this was really be great for my wife. Does it come in a size that fits the newer iPhone 6 Plus.... this phone is a bit larger. Yes it does, Randal! Your wife will love it! @Randal I think your wife may have the new iPhone 6S PLUS, and if so, it fits the iPhone 6 PLUS case! I would double check with her first as the regular 6/6S and the PLUS 6/6S are different sizes, but one of them will certainly fit hers! I just wouldn't want you to order the wrong one. Your wife will LOVE it! Kudos on being an awesome, and savvy husband! @Kelley Thank you. (and Mike too) I probably said the model incorrectly... but I believe she has the BIGGEST iphone available. Just got it a couple of weeks ago. I ordered already and ordered for the "Plus". I feel confident that it will work. If not I will return it and order something else. I just started seeing your emails when you sent out a promotion. Great and Interesting stuff!!! I look at all the items with every email. Happy to help and have you as a fan, Randal! Good Morning I have two questions. Will it fit an iphone6plus in a protective case example: otter box or life proof? Secondly is there a tan/cream color? I wear mostly Browns. At the moment, the answer to both is no. The iPhone 6+ is the largest case and if you add on to the phone's size you will likely stretch the material if you can fit it in at all. There is no tan/cream yet, but it is always a possibility for the future! @Heather although you cant fit your otter box or lifeproof case inside the pursecase, you dont really need it. While pursecase isnt completely waterproof, it is "drop" proof and does protect the phone. Does the gray & black have silver chains? Is the black parsecs and cross body chain available now through The Grommet? What is the lead time? I would like to order some for Christmas. You should have no trouble getting them for Christmas. Though if you're talking about parsecs, I'm imagining you are in some sort of spacecraft...if that is the case you might have trouble getting it in time. Need to wait for the Samsung Galaxy version!!! @Sonja what type of Samsung Galaxy do you have? I have an iPhone 6 plus. Which case do I need to order? Can I leave my phone in the hard case and still fit it in the purse? It will depend on the phone and case you have, Jackie. You could try getting a larger Pursecase to fit it, but there is a good chance you stress the materials and compromise it's effectiveness. Will it fit on an iPod touch 4th generation? You'll have to measure it against the size of the phones available, Serena. My guess would be no because they are specifically made for phones. Not so keen on the chunky chain thing, just not my style, and I cannot have metal touching my skin. If there are no options there, my plan is to go to the thrift store and pick up something that has a long leather or fabric shoulder strap (hooks on both ends) on it, and use that...simple! Would also like to remove the hand-strap when not in use. Congratulations on bringing this to market! @Beki thanks for your feedback and praise! I hear you on the chain- we are working on coming out with some different options, so sign up for the daily grommet emails for updates! I think your idea of the thrift shop for now is very DIY and a fabulous idea!!! If you do end up doing this, I'd love to see the final product! Since our cross-body chains are removable, you certainly could make your own or use your favorite handbag chain instead (as long as it has hooks on both ends). We will also take your feedback about making the hand-strap removable into consideration. I hear that often when people first buy the pursecase but then they have come back and said that it actually doesn't bother them- that they actually like having it- so I'll be curious to see what you think! Also- regarding the Note 3- the iPhone 6 PLUS pursecase fits SOMEWHAT on the Samsung Note 3 phone model as they are roughly the same shape and size. It's by no means a perfect fit, and the camera does not line up (as it wasn't made for that phone) but we have some die-hard pursecase fans who use the iPhone 6 PLUS pursecase on their Samsung Note 3 as they couldn't live without the product! Will an iphone 6 fit, if it already has a "life proof" case that I would like to keep on it? (Because of kids and phone needs to be waterproof) Thanks! @Kimberlee I often joke that the case is "kid proof" as we often find it turns out to be a favorite chew toy or accessory (whatever mom uses frequently is what your kid wants- right!?) however it's not waterproof. While I have dropped mine in the sink before (and it's been totally fine!) I wouldn't recommend it. Pursecase protects from drops, but not from water damage. Sadly it's made to fit snug on your phone (for maximum protection) so you would not be able to keep the lifeproof case on with the pursecase as it wouldn't fit. Hi Kelley, At the risk of sounding like everyone else here who can't read and keeps asking questions already answered many times, where can I sign up for email updates? Or are you referring to our daily Grommet email? I am not Kelley, but I am indeed talking about the The Grommet daily emails. That is how you will know when the Samsung models are available. @Guest @Mike has got you covered! The Grommet daily emails will keep you up to speed. In the meantime, let us know what Samsung models you'd like to see. I have a Galaxy S4, Samsung, will this phone be too small? @Jane Hi Jane, yes, sadly the pursecase is made for the various iPhone models and we do not currently have one that fits the Galaxy S4. Check back for updates! Would love this for my Galaxy Note 4. Keep a look out, Robin! I just made this purchase for my 22 year old who will love the compact stylish case carrying money, credit card, and a driver's license. She's a minimalist who carries a purse only if absolutely necessary.. This will go over very well!! We think so, too! Let us know her review! @Guest thank you so much!! I had that age group in mind when I created the product- and they indeed love it- however I've been pleasantly surprised that our customers are ALL AGES! In fact some of our biggest fans are age 70+! It's fun to have a product that appeals to all different ages and walks of life. I love this idea, however, I'm a green, gold, orange, brown, turquoise, yellow, cream kind of girl. Any hope of additional colors soon? I know it's hard to launch with too many colors! I'm sure that is on the horizon, Holly! Keep an eye out! I have an older Galaxy, an S3, but I would really appreciate this kind of case and so would my sisters, who have the same model. Stay tuned, Leslie! New designs will be coming out in the future! This is a great idea for girls who only carry their phone out but don't always have pockets in their evening wear. However I'm not a fan of the cross body and with a clutch you might as well be carrying it in your hand for all the freedom it affords you. Will you be coming out with just a shoulder length strap? That I would buy instantly and was rather dissapointed when I saw you didn't have it. Hi Sherellyn, thanks for the feedback. I have no doubt this idea will be batted around the Pursecase offices as they continue to develop the product! @Sherellyn actually the long strap is detachable, so you could use the pursecase without it! And you can wear it on your wrist. When the long chain is attached, you barely even notice the smaller chain. Often customers are concerned at first but pleasantly surprised at how well it works. OR you can use pliers to easily remove the small handle if you decided you really didn't ever need it. Let me know what you decide! Hi Kelley, I think your product is great! I would like to try one but my only hesistation is that I've tried several different kinds in the past and the problem I always run into is the the amount of cards you can carry. I find I need to carry so many that they always bulge the product and eventually the seams give and rip. How many does this allow? I've 5 debit/CC, my insurance cards(3), ID, grocery and bulk shopping cards. I do not want to carry a separate anything, which to me negates the whole idea of this kind of carrier. Hi Patricia, you should be ok fitting that amount of cards. The case is wide enough that you could almost create two stacks of five cards. If it isn't big enough, maybe pick your favorite debit/credit cards? @Patricia hi there!! thanks for your question and i get it. The pursecase pocket size depends on the size of the model pursecase- for example the pursecase for iPhone 5 pocket is slightly smaller than the pocket on the iPhone 6 PLUS because it's a smaller phone. I have the iPhone 6 and I comfortably fit 4 credit cards, 5 business cards, my drivers license, and the compact mirror (which is included and removable) in my pursecase at all times, but I've known ladies who keep more or less in their pockets! But without bulging I would say you can fit 5 credit cards in the iPhone 5, 7 in the iPhone 6, and 9 in the iPhone 6 Plus. @Patricia- If you have the iPhone 5- the smallest one- I think you could fit maybe 3 of your credit cards if you wanted to also include the insurance cards, ID, and Grocery cards. You would be able to fit all of your stuff in the pocket but it would bulge slightly and may compromise the picture taking ability- as when the pocket bulges out it can slightly interfere with the camera hole. My recommendation would be to try to cut back to just the essential couple cards you use multiple times a day and then keep the rest in a small pouch nearby- maybe you could clip it on and off. That's what I do. I hope that helps! @Kelley thanks so much for your quick response. Yes! That's exactly what I needed to know. I look forward to trying out your product soon and hope you get more colors and strap options soon. I'm going to get the basic black for now. How many credit cards / ID will the Pursecase hold? @Janet it depends on the size of the pursecase- for example the pursecase for iPhone 5 pocket is slightly smaller than the pocket on the iPhone 6 PLUS because it's a larger phone. I have the iPhone 6 and I comfortably fit 4 credit cards, 5 business cards, my drivers license, and the compact mirror (which is included and removable) in my pursecase at all times, but I've known ladies who keep more or less in their pockets! @Linda not sure yet- but keep checking back on The Grommet because we hope to! What types of specific Galaxy models would you like to see? Hi Kelley, will you be introducing for Samsung smartphones? I use the Galaxy Note 5. Hi Jennifer, yes, that will be coming out in the future. Keep a look out because we will be featuring it on The Grommet! It fits iPhones for now, Marlene. Further product availability will be coming out in the future. Stay tuned! Hi I love your product. Great for walking around in NYC, Question I have a Samsung Galaxy S6 cellphone, do you have a smartphone clutch for this model phone ? Thanks for the kind words, Rochelle! There is not a model for the Galaxy S6 yet. You might be able to get an iPhone 6 one to slightly fit it, but if you want a snug fit, stay tuned for future models! @Mike actually the Galaxy S6 doesnt fit in any of them. The Galaxy S5 fits "sort of" into the iphone 6 case, but not the Galaxy S6 I'm afraid. I know- CONFUSING! So close! Thanks for the clarification, Kelley! They very well could, Mary. Keep an eye out! 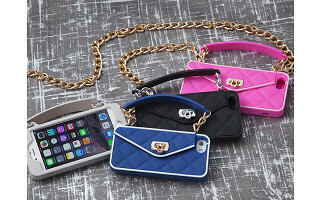 Is you Pursecase available for Android phones? Is purse case designed to hold a phone that has a skin/ cover already on it? In other words, would I need to remove the existing cover in order to slip my phone into this purse Case? Love the idea and look of this! Thanks! Hi Patricia, it is not designed for phones having a skin, but that might not be too big of an obstacle. If it is indeed too tight, you can utilize Pursecase as your new case! @PATRICIA The pursecase is not designed to fit over another cover, but the silicon material absorbs shock well and will protect your phone as well as any other case, just with more style! Are these Pursecase made to accommodate an iPhone only? At the moment, yes! But stay tuned for updates, Rochelle! Thanks for the feedback, Joanne! I'm sure they will consider it for the future! Wow! Can you clean the purse side if a light colored one gets dirty? Since I'd only like a silver chain, I'm leaning toward the gray Pursecase. Yes you can, Karen! Another one of the great benefits of the silicon material! This appears to be just what I'm looking for when I go to a casino. I need my phone and space for ID & some money. Am I safe in assuming that the case for the iPhone 5 will fit my 4s? Hi Maureen, the 4S is slightly shorter than the 5 so it may not be a perfect fit, but you can certainly try! @Mike We offer pursecase in a size 4 and 4s as well! Will an iPhone6 still with protective case on backside fit into this pursecase? Unfortunately not, Deborah. Because they are such a snug fit, you would end up harming the material if you even could make it fit. When you make one for Samsung Note 4 or 5 I will be ordering one. Perfect! But I have a note phone. Please tell me you can options for all sizes. Keep an eye out for updates, Vicki! I would LOVE a purple one! If it would fit a Samsung Galaxy S3! This is awesome! I have a Galaxy S6 and will be looking for updates if you make these for other phones. Glad to hear it, Ashley! There are a lot of Samsung Galaxy users out there. Why only for iPhone? Because unfortunately, Laura, there are seemingly infinite more iPhone users. Pursecase turns your phone into a tiny designer purse. This silicone phone case cleverly mimics a quilted handbag. Carry your phone in style, and hands-free, over your shoulder or wrist. As functional as it is adorable, Pursecase won’t interfere with your phone’s screen or camera. You’re free to dial, scroll, and even take pictures. A small pocket lets you carry other essentials, like an ID, credit cards, and cash. And the compact mirror comes in handy to check yourself on the go. Founder Kelley Coughlan Weaver is a busy publicist who wanted a fashionable way to carry her phone. So she invented one, then brought it to "Shark Tank” and got funding for her phone purse.